Turquoise and red is my favourite colour combination for the summer. About ten years ago I used to have a simple red strapless top by Toi&moi - quite similar to this one - and I wore it with a short strand of real turquoise beads. I guess history and fashion repeat themselves, even if it's the opposite way around. I'm not gonna tell you much about my new favourite summer bag seen above, until the next post that is. This is supposed to be just a teaser preview. Turquoise strapless top, H&M. Off-white skirt, ZARA. 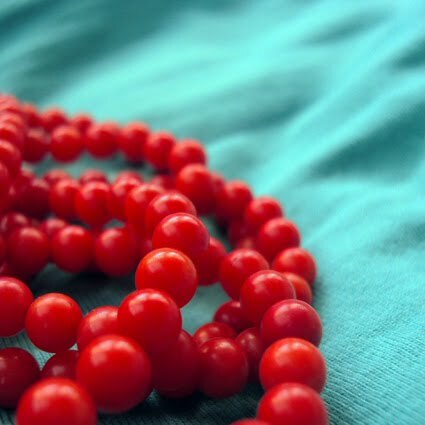 Red necklace, made by me from coral beads. Sandals, Bronx (bought in Amsterdam). Charm bracelet, Accessorize. Embroidered canvas bag, A.L.E. Oh wow, love the combitations of these colors! Light blu and red! Fresh and cool outfit! ωραία αντίθεση κάνουν αυτά τα χρώματα!!! Turqoise to cool down and red to keep the fire burning! Nice summer contrast, looking great on your tan. but i must find out more about this bag, it looks like a greek souvenir-kinda-bag, i love the embroidery!..